When the Ministerial Council of the Organization for Security and Co-operation in Europe (OSCE) met in Hamburg in early December 2016, the German city had to conduct the largest police operation it had ever orchestrated, with 14,000 police officers providing security and protection. And this was only a warm-up for the G20 conference that's scheduled for July, when government and financial leaders from industrialized and emerging economies around the world will gather in Hamburg to discuss how to shrink disparities in development and minimize poverty. Although police work often involves bringing a wide range of data—such as live traffic feeds, maps of emergency responder positions, and geodata from different government agencies—together in command centers, the Hamburg Senate determined that these two events required a new solution. The idea was to pool all the data together in a shared geoplatform where people working at every level of the command structure could access the information in real time. 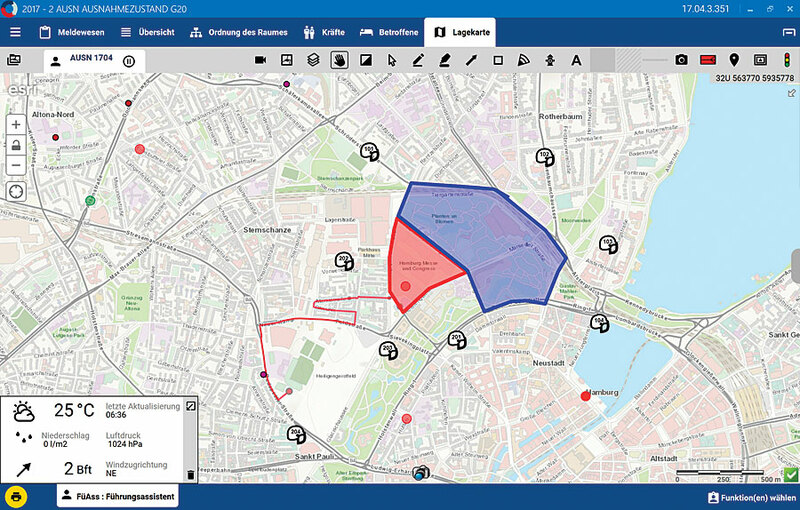 The backbone of the geoplatform—and of Hamburg's smart policing initiative—would be ArcGIS. To make everyone's information work together seamlessly, Esri partner Eurocommand built CommandX, a 64-bit system that communicates with ArcGIS Server and Portal for ArcGIS—both components of ArcGIS Enterprise, which lets users run enterprise GIS on their own infrastructure and behind firewalls. CommandX enables data to be shared rapidly and securely. It has a bidirectional interface with ArcGIS, so users get live access to the basemaps, layers, and data and can edit services and save web maps. With CommandX and the new hardware, all members of the command structure can receive a realistic picture of the on-site situation without being there themselves. Thus, emergency responders for the OSCE meeting in Hamburg were going to have a crucial advantage that they hadn't had before: the ability to get ahead of a problem and act with confidence instead of merely reacting to an escalating situation. For a recent meeting of the Ministerial Council of the Organization for Security and Co-operation in Europe (OSCE) in Hamburg, local police officers worked with federal agencies using a shared geoplatform so that people at every level of the command structure could access information in real time. The first trial run of the geoplatform happened on October 8, 2016—the day Germany's national men's soccer team played the Czech Republic in a 2018 FIFA World Cup qualifier game at Hamburg's Volksparkstadion. Not only did the German team play together smoothly, winning 3-0, but all the agencies running security for the game, which drew a reported 51,000 fans to the stadium, worked together seamlessly as well. The reconfigured technology delivered good results. Using CommandX, along with the geoplatform and other smart technologies, doesn't have to be limited to coordinating security for big events, either. In the long term, the Hamburg police intend to use components of this system to support their everyday work in smart policing. Having such a vast network of interconnected data could help the police analyze burglary statistics, for example, to predict where organized groups of burglars are most likely to strike. Additionally, the department could survey social media data to forecast protester movements during demonstrations.